Mail4Rosey: Celebrate National Dental Hygiene Month with ToiletTree! Celebrate National Dental Hygiene Month with ToiletTree! October is National Dental Hygiene Month, and have I got a product to share with you!! 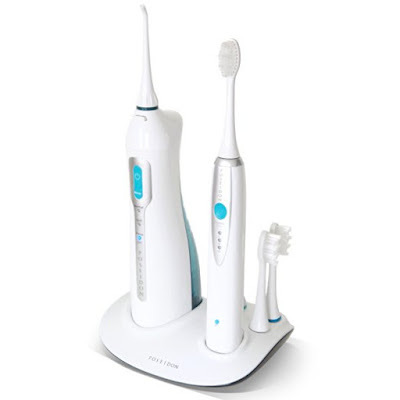 This Portable Oral Irrigator and Sonic Toothbrush set sold at Toilettree is in a word: fantastic! I say purchase it this month in honor of the national recongition towards oral health care, or any month to have an extra clean mouth and a sparkly smile! I admit it, I am thinking about Christmas. I always have it in the back of my head, and year round I pick up things here and there that I think people would like. It saves me a fortune when the holidays come around because I've usually found and bought things at a good price. It is worth it to note, considering I am discussing one here, that an item that is always on at least one person's holiday gift list, every single year, is an oral irrigator. I''ll admit I've never purchased one to give (yet!) but the fact that it is so popular makes me curious about the item itself. Using The Poseidon Oral Irrigator and Sonic Toothbrush Combo has made me a believer. I can now see why this is a popular gift item request!! The Poseidon Combo Set comes with both a sonic toothbrush and the oral irrigator. One of my favorite things about this item is that it comes with a stand that duplicates as the charger. No more hunting for a charger or worrying that your dental items aren't charged when it comes time to use them! Simply set them in the base that is plugged into your wall, and know that they'll be ready to go when it's time to use them again. The charge lights are an attractive light blue too, that serves us well for a mini nightlight in the bathroom. What you see in the picture above is what comes in the box: the portable oral irrigator, three color coded pulse tips, the Sonic toothbrush, three color coded brush heads, and the electric base that holds and charges both items (and holds the brushes and tips!). When you use this set, it works so much better than brushing alone!! I was amazed at how much was still left to clean after I brushed what I thought was very carefully. I think this is definitely an item that should be in everyone's bathroom, and yes...if you're thinking of holiday gift buying already, I think you should put it on your list (to buy, or have bought for you!). I give it a most excellent rating and a high recommendation. You can learn more about this set, by visiting the ToiletTree website. You can also follow along on Facebook and/or Twitter. That is an awesome set! I love the water pick. Dental Hygiene should NOT be overlooked. I love this set. I love the water flosser. They're so much easier on my gums than regular floss. I've been curious about the oral irrigator part of this. Seems like it would be really helpful and useful. We have gum disease in our family, so the oral irrigation tool would be a great addition to our oral care routine. I have never heard of an oral irrigator, but this sounds really interesting! I like that it can be used for multiple people, that's a great feature to have. Toilet Tree products are fantastic! I would love to have this so I can get the best clean for my teeth. They make some great products and I am so glad they understand the importance of dental hygiene. Dental hygiene is so important. That sonic toothbrush sounds like it would keep your teeth sparkling clean. You could really get a complete clean with this combo kit. It does sound like it could make a great gift. What a great way to make brushing teeth easier and not so routine! Would love one of these. 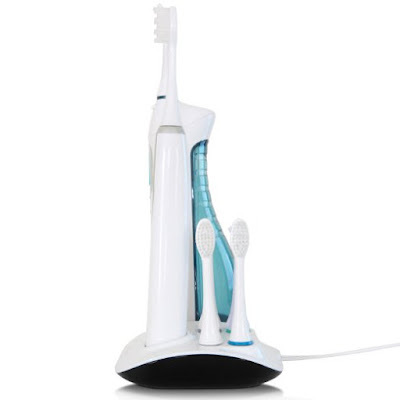 I am obsessed with keeping good oral hygiene habits and would be thrilled if someone bought me this for Christmas! This would make a great gift. I would like to have one too! This is an awesome gift idea for the holiday! I could use one of this for myself too! Oh, never knew about this national dental hygiene month. This reminds me that I need to visit my dentist soon. I had no idea it is national dental hygiene month. What an interesting toothbrush set. Have a great weekend. Oh yes, I like the portable idea! And so many national days in October!!! wow. Great review. I have always wanted to have a smart toothbrush that was powerful! I've heard that these types of toothbrushes do wonders for your oral care. You're right, it would be a great gift! I want one of these for myself. I think I'm going to send one to my Granddaughter. I really want an Oral Irrigator. I think it will really help with my oral care.